Apple paved the way for racially diverse emoji to come to the Mac two week ago, and now with the release of iOS 8.3 beta 2, Apple has added access to 300 new emoji for iPad and iPhone users. With iOS 8.3 beta 2 Apple now allows users to choose between five different skin tones for 60 different emoji. Switching between the different skin tones is just as easy as adding an accent mark to letters: simply press and hold an emoji to reveal the the entire palette of color options. 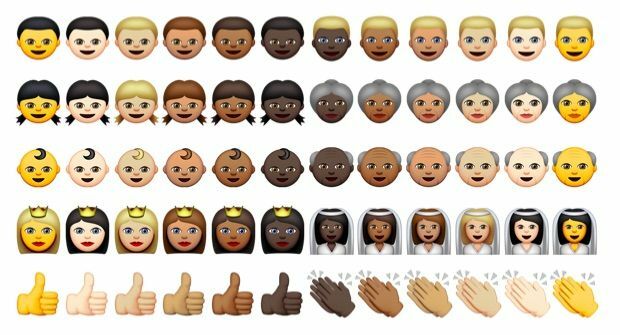 The new racially diverse emoji are also available in the new OS X 10.10.3 beta. Mac users can pull up the characters by hitting CNTRL + CMD + Space. Once your select a color variation for an emoji your changes are saved in the keyboard, so you don’t have to change them every time.